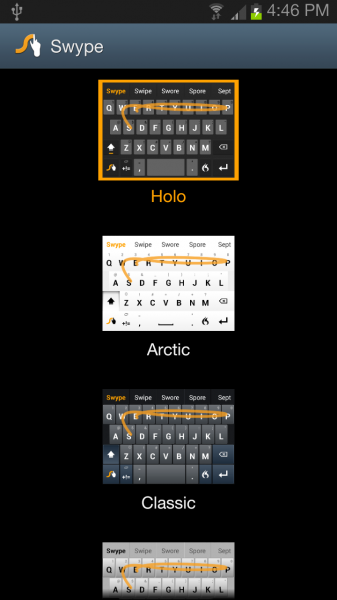 Swype is a virtual keyboard for touchscreen smartphones and tablets that allows user to input text by sliding a finger or stylus from the first letter of a word to its last letter, lifting only between words. Swype provides better and faster keyboard experience by using error-correction algorithms and a language model which learn from the way user input text to guess the intended word. It also includes many other features which make it one of the most powerful on-screen keyboard available. Bilingual support that lets users enter words from two languages at once. Customization options including long-press delay, vibration duration, keyboard height and mini left/right keyboards in landscape mode. Accessibility support for Android’s “Talkback” and “Explore by Touch” accessibility features. When accessibility features are enabled the user’s entered text will be spoken back. Swype Living Language & Hotwords keeps you always up to date with a real-time, crowd-sourced and news derived language model supplement with localized dialect dictionary that gives you immediate access to our continuously updated language dictionary. Personal Dictionary Backup & Sync makes it so your personal language model and dictionary are automatically backed up and synced across all your Android devices. Dragon Dictation’s voice recognition lets you go hands free and turns your voice into text quickly and accurately with a simple press of the Dragon key. Available in 36 languages. Dragon allows you to see phrase-based results in near real-time without leaving the dictation UI. Smart Editor analyses an entire sentence, flagging potential errors for a quick fix, and includes suggestions for the most likely alternatives. Smart Touch learns your unique style of input and continuously evolves and adapts to your typing patterns for a truly personalized keyboard experience. Keyboard Themes yo personalize the look of your Swype keyboard to one that is all your own. Voice & Text Dictionary Sync: New words added to your Swype keyboard personal dictionary are synced across all input methods, which means that you can easily Swype, type or Dragon dictate that new word. Gestures support for quick everyday tasks. 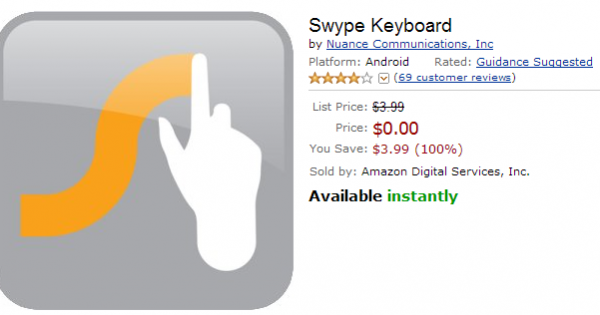 Swype normally costs $3.99 to purchase on Amazon Appstore (aff) or Google Play. On March 21st and 22nd, 2014, you have a chance to grab and download Swype for free, through Amazon Appstore. Amazon Appstore is celebrating its birthday by offering 16 apps for free, one of which is Swype. Get Swype (aff) for free. Act quick and offer expires on March 22nd, 2014. Amazon Appstore app is required to install Swype.